The Global Taskforce for Post-2015 Development Agenda and towards Habitat III, facilitated by UCLG, represented the voices of local and regional government organizations at the second Habitat III PrepCom from April 14-16 in Nairobi. The United Nations Advisory Committee of Local Authorities (UNACLA), chaired by the President of UCLG and Mayor of Istanbul, Kadir Topbaş, also met in Nairobi. It was decided that the agenda of the Committee would focus on preparations for Habitat III and that its membership should reflect the composition of the Global Taskforce to ensure close coordination between the two. Over 70 local and regional government delegates from around the world, including the mayors of Istanbul, Quito, Berlin, Victoria, Almere, Morogoro and Emalahleni, came together in Nairobi to participate in a number of different sessions and side events. The local and regional government constituency event took place on 13 April and was attended by the Co-Chair of the Habitat III Preparatory Committee as well as Secretary General of Habitat III, Dr. Joan Clos. News of the organization of the Second World Assembly of Local and Regional Governments, to be held in Quito, was presented to the Bureau of the Habitat III Conference and in a press conference. Despite positive declarations by some Member States at the Plenary of the Preparatory Committee, and recognition of the work of local and regional governments in preparing a Second World Assembly, procedural rules for Habitat III were not adopted. Member States expressed doubts about the modalities of participation of stakeholders, in particular of local authorities, and decided to postpone the decision. While the Global Taskforce delegation’s goal had been to see agreements on the improved participation and accreditation of local governments as soon as possible, local and regional governments are still hopeful for an inclusive process. The local governments of the Global Taskforce are keen to continue discussions with Member States to underscore the importance of their involvement in the Habitat III process, and to keep them informed about the preparation of the Second World Assembly of Local and Regional Governments. The Global Taskforce is convinced that Habitat III will be a key mechanism through which to implement the Post-2015 Agenda at local level and to address specific issues related to human settlements that will be the basis for a sustainable future. Kadir Topbaş and Mayor of Victoria and Co-president of UCLG, Jacqueline Moustache-Belle delivered a statement on behalf of local and regional governments to the Plenary. 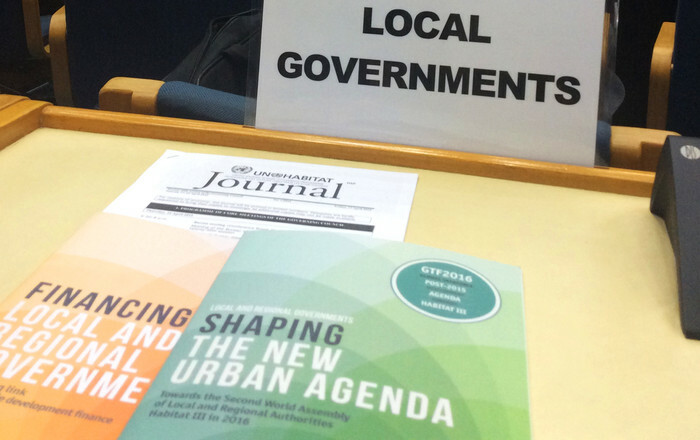 The agenda that organized local governments want to bring to Habitat III is not related to domestic affairs, but rather local solutions as contributions to global challenges. The new urban agenda cannot be defined without the local managers and elected representatives accountable to the inhabitants”. The special event for local and regional authorities, organized on 13 April as part of the official programme of the Second Preparatory Committee for the Habitat III Conference, aimed at recalling the spirit of Habitat II, where local governments were recognized as one of the main partners of UN‑Habitat in the implementation of the Habitat Agenda. Habitat II was also an important step forward in the recognition of the relevance of international networks of local authorities. As a result of the First World Assembly of Cities and Local Authorities, organized in the framework of Habitat II in 1996, local authorities committed to build UCLG as a “single voice for local governments and their associations”. The Global Taskforce was born in 2012 of the same will to bring together all major networks of local and regional governments to work together on advocating for this constituency in the Post-2015 Development Agenda and Habitat III. Over the last 20 years, the partnership between local authorities and UN-Habitat has been expanded and reinforced. Habitat III is an opportunity to assess this partnership and make a qualitative leap forward in the relationship between the UN and local governments. Local governments should be recognized and given special status by the UN, and afforded a more direct role and increased responsibilities in the governing bodies of UN‑Habitat.